“Far seeing merchant, citizen, sage, counsellor and administrator, constant friend of humanity,” reads the inscription. Abraham Shuman was a philanthropist who made his fortune in the clothing business and helped the poor by donating generously to the Boston City Hospital. He served on the City Hospital Board of Trustees for fifteen years, part of that time as President of the Board, directing its growth from a small struggling medical concern into a large hospital of high standing. As a wealthy merchant, he also took on the direction of banking institutions and was successful there as well. Shuman Corner is the beautiful Filene’s building at downtown crossing in Boston, its grand business apartments epitomizing his standing in the business community. Shuman was also a patron of the arts and a Trustee of the Museum of Fine Arts. He established the Shuman Fund which enabled the museum to purchase many works of art, bequeathed many paintings to the museum at his death, and donated at least three portrait busts to Boston institutions. How Frederick W. Allen was chosen to do this great man’s memorial portrait is unknown, but as an artist connected to Dr. Weld of Harvard Medical School where, as a young man, he fashioned wax models of diseased body parts for study, he may have made his connection. Or it may have been Boston University Medical School for whom he modeled a fine bronze portrait of Dean Sullivan, funded by his students for his retirement, and a portrait bust of Woodrow Wilson for President Marsh. It could have been his portrayal of other medical and political personalities, including Mayor Peters who replaced Shuman on the MFA Board upon his death. Whether it was those in the medical community or simply his connection to the patrons of the MFA is a question that may never be answered. He was sought after for his uncanny ability to create likenesses and so his reputation grew among Boston’s elite. 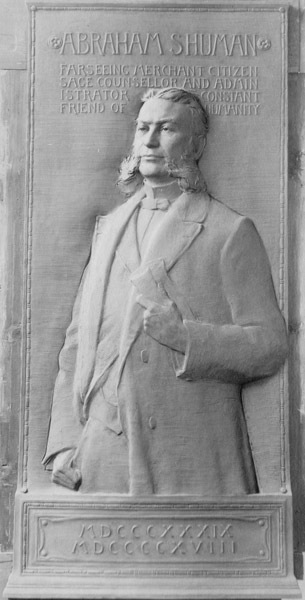 The three-quarter life size portrait he created of Abraham Shuman is a particularly fine work of art, comparable to those of Augustus St.Gaudens who was the teacher and mentor of Allen’s own teacher and mentor, Bela Lyon Pratt. Compare these two portraits, the one above left, of Shuman (1839-1918) sculpted by Allen and the one on the right by St.Gaudens of the artist George Hollingsworth(1813-1882). It’s easy to see the similarity. Shuman, a well-dressed neatly groomed man with a kind and dignified face stands casually with his thumb in his pocket, holding a paper rolled in his left hand. He looks as if he were coming to conduct a meeting with his coat on over a three-piece suit, sporting a trim high collar and slim bow tie, the chain of a pocket watch showing on his vest. The frame and the date inscribed in Roman Numerals that forms the rectangular base is similar in both portraits and the name of each man is punctuated with round decorative rosettes or stars. Shuman is turned toward the viewer, where Hollingsworth is more in profile, his hand on his hip and the other on a book, but the poses are similar. Note that the bent elbow of each man crosses the frame, bringing them closer to the viewer, a technique first used by St. Gaudens. Both men sport beards, Shuman a jaunty mutton chop style and Hollingsworth an untrimmed full beard and mustache. The character of each man is evident, Shuman a business leader and philanthropist, Hollingsworth an esteemed artist and teacher. 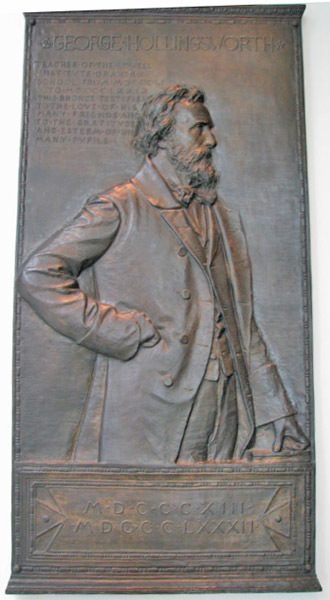 Shuman is shown in the original clay where Hollingsworth is in a dramatic dark patinaed bronze, the Shuman plaque is 1/4 smaller, but the legacy is clear. Shuman’s portrait was originally placed in the administration building of Boston City Hospital. When the building was torn down, the plaque was moved and has not yet been discovered. If you know of its present location please contact the author.